John Lepper believes the section of village code allowing playgrounds or gyms of less than 90 square feet without a permit means his treehouse is legal. A Babylon homeowner who has been fined hundreds of dollars for an illegal treehouse is appealing the decision, hoping a judge will consider his military service and criticize what he calls a broad village code. John Lepper lives in the Village of Babylon with his wife and two children, Bayden, 6, and Brianna, 5, and erected a treehouse in his backyard last spring. Lepper said a secretary in the village building department told him at the time that his own drawing and a survey from 2012 when he bought his house were sufficient for village approval, but village officials say they’re not. 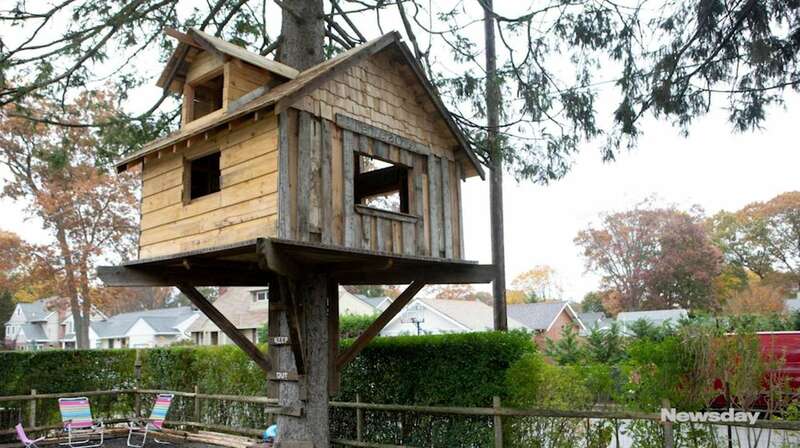 He believes the section of the code allowing playgrounds or gyms of less than 90 square feet without a permit means his 86-square-foot treehouse is legal. Village officials told him to tear down the structure, unless he submits professional architectural drawings and a survey. He may also need a setback variance from the village zoning board of appeals. Village Justice John Rafter fined Lepper $475 on Oct. 17, and on Tuesday, denied Lepper’s request, made through his attorney, Cory Morris, to dismiss two more related charged charges and overturn his previous decision. Morris argued Lepper’s service should afford him some lenience. The judge disagreed. “It really has no bearing on the issues in this matter,” Rafter said. Morris, who is representing Lepper pro bono, contends that the village building code is unconstitutionally broad, and he argued against Rafter's inclusion of the Merriam-Webster definition of a building in his Oct. 17 decision. Morris argues that definition could apply to everything from a birdhouse to a children’s playhouse, all of which would need village approval. He asked the judge to issue a stay preventing further fines being levied against Lepper while he appeals the judge’s decision. Village attorney Gerard Glass advised the judge that he doesn’t have the power to do so, to which Rafter replied, “I have no intention of enjoining anyone." In an interview after the hearing, Lepper said he's appealing the decision.